Okay, that could be the shortest and least in-depth blog post ever if I were to quit right there, but regardless of the explanation I give, it'll all go back to that point. That's right kids, in an attempt for the Bolts to get more interest from the NHL and from their own fans in Tampa, they hired one of the most recognizable hairstyles to be their bench boss. This is a team who is four years removed from a Stanley Cup championship and they are are in such dire straits that they need to go the route of hiring due to recognition rather than qualifications. Way to start off on the right foot new ownership group. But, what can you do?? You have to give Hollywood producer and Bolts co-owner Oren Koules some props for creating a buzz in the hockey world off the hop by getting Melrose back behind the bench. What better way to draw attention than making it with a move like this. Forget they drafted first overall, forget they have a bevy of talent they could market...you need Melrose to be the guy to guide this team to drunken mediocre. Now, this is not because I have something big against Melrose. 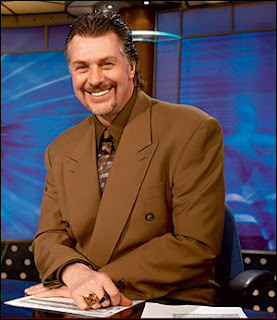 I think he's a great analyst and I think a personality that could be big asset to American coverage of the NHL on TV. It's just that he was choice based on that and not his history. Melrose is 82-103-31 in two-and-a-half seasons with the LA Kings, which is defining moment is taking the Kings to the Cup finals. And sure, Melrose has a Calder Cup and Memorial Cup to his name-- but that was eons ago. The game is new, the caliber of players are better, and as a whole-- I think this move could be more of an albatross for the Bolts than a god-send. If you want to bring a team back into the spotlight, the Bolts needed to get a coach who will actually get the job done and get the team back to prominence by winning and making waves that way. Someone like Joel Quenneville would have done the same job that Melrose could do, but better and in a quicker turnaround time. It's Hockey Personnel 101 and maybe someone should give the new Tampa owners a crash-course on this subject. In the end, the only good thing to take away from this is that ESPN could be knocking on my door to give me a contract offer to be their new studio analyst. Hey guys-- Facebook me and we'll talk. It was quite the scene in Ottawa. A decent amount of trades, involving actual players this year, and the whole pomp and circumstances of the NHL Draft shone through. Of course, there will be many questions after this weekend in order to determine what to think about next season. The Draft first, and the idea of being the deepest draft ever held true, with a couple teams going really off the board in order to get their player. It wasn't until the Senators picked Erik Karlsson with their 15th pick that it start to go off the board. Karlsson was rated by The Hockey News at #71 on their top-100, though he was the 4th ranked European skater according to Central Scouting. Two picks later, the Ducks went really off the board in taking high schooler Jake Gardiner, who was 23rd North American skater, but overlooked by many people out there. However, the biggest steal could be the Los Angeles Kings taking Justin Azevedo from the Kitchener Rangers in the 6th Round. Azevedo was by-passed in last year's draft, but came back strong with a 124-point season this year and helped the Rangers go ahead to the Mem Cup finals. I'm definitely on the bandwagon now for the Kings, especially if they can get all their cylinders popping. The trades were very interesting. With them actually involving rostered players, it made it that much more fun. -Olli Jokinen heading to Phoenix FINALLY puts to rest the rumors of him getting out of there. He had requested something go down and now he becomes a big fish in a medium sized pond. Alongside of Shane Doan, the Coyotes offense could become very potent. In return, the Panthers get Keith Ballard and Nick Boynton, which should help their hurting blue line and could spell the end of Jay Bouwmeester's tenure in the Sunshine State. -Alex Tanguay getting sent to Montreal also ends those rumors being thrown around. It also opened the door for the Flames to get Mike Cammalleri from LA. Tanguay should help keep the consistency of scoring going for the Habs, while Cammalleri will give the Flames some help down the middle, even though they have alledgedly signed Daymond Langkow to a long-term deal. -Earlier in the day, Ray Emery and Dan Cloutier got bought out of their contracts, which should come a no surprise. Emery was a distraction and was usurped by Martin Gerber in net, while Cloutier never really recovered from his days in Vancouver. Though I'm sure some team will take on Emery to see if they can change him, odds are Cloutier's done for the foreseeable future. -The Predators goaltending situation was solved with the Preds signing Dan Ellis to an extension, while Chris Mason was dealt to St. Louis to back-up for Manny Legace. Mason hit a big rough spot for the Preds and the fresh start could do him well, but Ellis came back to help the Preds to the playoffs and did all he could to help the team win. That's just the tip of the iceburgh, but it's time to party for now. I'll be back next week with some more news and notes as we get ready for free agency season. By this time tomorrow, yours truly will be in Ottawa; getting ready for the NHL Draft festivities. There's a lot of things that you can look forward too and a lot of things that should be looked out for this weekend. Here's a list of some that come to mind. -This has been touted as the deepest draft ever, so it should be interesting to see where these players go. Outside of Steve Stamkos going #1 (and there's some who think even that's not a lock), the rest of the line could go any number of ways. Of course, we can't gauge a draft class for a while, but check in five years to see how these picks turn out. -Trade rumors are going to be buzzing, especially concerning the host Ottawa Senators. There's already a buzz around about the Sens wanting to trade up to get a top-10 pick, but they'd have to give up the 18th pick and a roster player in order to do so, which could be too rich for Bryan Murray's blood. -Also, what's going to happen with Patrick Marleau. With his no-trade clause and hefty salary extension set to kick in on July 1st, the Sharks seem to have Marleau in-play. Jonathan Cheechoo's name has also come up, though the Sharks may want to hold onto him for the short-term. -Olli Jokinen has told the Panthers' management he would like to be traded. This could result in some major bidding during draft day. Granted, he could be traded after then, but it seems with all the GMs and management groups in one room, you'd think this would be the prime place to get a major deal like this done. -What will FOHS spawn this draft?? Last year, our crew created the legend of the Sombrero, who is a local legend and of folklore to the folks of Columbus, as well as becoming a phenomena on the Interweb and in the DC media. Should be an interesting weekend, and I'll be at ground level. Not only will I be checking in here with some updates as I hear it, but I'll be live-blogging on Going Five Hole during the first round of the draft. You should stay tuned-- I need to pack. It's taken a couple of days, but it's time for me to genuflect on Dominik Hasek and the career he had. It was a bittersweet end for Hasek. Granted, he won the Stanley Cup, but only because he was lit up in Nashville, which allowed Chris Osgood come on and lead the Detroit Red Wings to the Stanley Cup. Yet, even though he didn't lead the Wings to the Cup, his career as a whole will put him in the upper echelon of goaltenders of all time. Say what you will about Hasek, but he got results and was able to carry a team on his back just by being as solid as he was. If you take a look at any of those Sabres teams he was on, they couldn't get to the playoffs and have success if Hasek wasn't backstopping them. There were a couple things that really stalled Hasek's career-- arriving to the NHL late in his life and then having injuries later on in his career which had people doubting his abilities. That notwithstanding, Hasek gave the hockey world many memorable saves and was at the center of the reason why video review is in the NHL-- the Foot-in-the-Crease incident in Game Six of the '99 Cup Finals. Yet, when the Butterfly goaltending style was starting to take center stage, Hasek's "hybrid" style was the unique quality that made him the goalie he was. Frankly, there was no style for Hasek. He looked like he played a stand-up game, but he would stop the puck by any means possible. It was often exciting, often horrifying, often head-scratching-- but he got the job done. It wasn't just on the NHL stage, as his two Cup rings, six Vezinas, and two Harts spoke volumes-- but his international results weren't too shabby either. 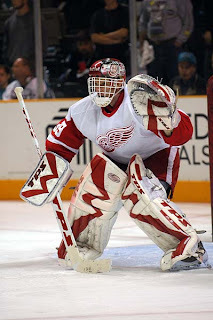 Hasek captured a Gold Medal in the Nagano Games in 1998 and a Bronze in 2006, while he had three Silvers in the World Juniors from 1982-1984, as well as a Silver (1983) and three Bronzes (1987, 1989, 1990) in the World Championships. Worldwide, Hasek could get the job done, regardless of the stage. On modern goaltenders, it's hard to keep Hasek out of the top-5, but all-time, he could very well be top-10, if not staying in the top-5. You either loved him or hated him, as you never really saw much of a middle ground when it came to fans. Yet, you have to give credit where it's due and with his credentials, it's hard to say he's not all he's cracked up to be. It could be a while before we see another unique goalie like Hasek. Is Balsillie Bad For The NHL?? It's pretty crazy that within hours of seeing the TSN article about Research-in-Motion's CEO Jim Balsillie's camp trading harsh words with the NHL, my June 10th edition of the Hockey News showed up with Ken Campbell talking about Balsillie's quest to get another Canadian team in the NHL, with Quebec City being the possible destination. If nothing else, you have to give Balsillie credit for keeping his name out there. It almost makes you wonder if Balsillie is the Mark Cuban of Canada. It's hard to deny this guy's desire to get a team and make it a winner, as well as a profitable venture. Also, he's a tech wizard who has drawn the ire of the other NHL owners, to the point where he may not be able to get a team because of the hatred towards him by the other owners. In the TSN article, Balsillie's camp has said that there have been eight teams who have contacted Balsillie about his interest in owning the teams. Richard Rodier, who is Balsillie's advisor, claimed that the NHL made it clear that they don't want Balsillie as an owner in the league. Bill Daly countered saying that it's not up to the league as a whole, but the 29 other owners who have to approve this move. That would be a sincere statement if it seemed that Gary Bettman didn't want anything to do with Balsillie when he was in the Nashville Predators deal or the Pittsburgh Penguins deal. Albeit, I have to side with the NHL on the Predators situation considering that Balsillie didn't own the team and was already selling tickets for the Predators....out of Copps Coliseum in Hamilton, Ontario. Usually moving a team that you don't own and starting to sell season tickets and luxury boxes will have the league frown upon that. That's like me moving a team to Kansas City and started selling tickets...especially since I own neither a team, nor the Sprint Center. Yet, with all the controversy surrounding Balsillie, is he really as bad for the NHL as the head office would have you to believe?? To be honest, he's the kind of maverick the league needs to get some more exposure. He's a guy who, while rough around the edges, could bring more good than bad to the league. Like I said, I draw comparisons to Mark Cuban. 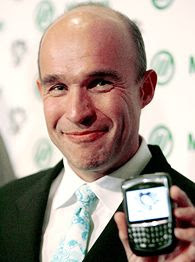 Plus, the connections that Balsillie has in regards to RIM and his tool the BlackBerry, it could very well be in the best interest in the NHL to allow Balsillie to own a team. His business sense knows no bounds and really could help bring any team he had to the next level in terms of exposure and revenue-- which the owners all love. Now, with that thought-- how will Balsillie acquire a team. Though his camp has said eight teams have approached him, you would almost think that expansion would be the easiest route to go. With rumors of prospective owners like Balsillie and Jerry Bruckheimer wanting to dip into expansion, it seems that it could be right over the horizon for the NHL-- regardless of what some pundits may say. Even NHLPA Director Paul Kelly said that NHL expansion into Canada is common sense-- which is where Balsillie could come in. In the end, if the NHL owners and Board of Directors shut down any attempt at Jim Balsillie to own a NHL franchise because they don't like his style or like what his motives are-- it seems to me to be a case of cutting off your nose to spite your face. Balsillie is a smart businessman who really would be an asset to the league. Even if he does ruffle a few feathers, the amount of attention he'll draw to the league will be like....well....what Mark Cuban did for the NBA. If you haven't known me for a while, I'm all about prospects and the Draft. Going to each draft, sans 2005, since 2002; it's just a great event. The season is over, the future is now-- and beers flow like wine. But, it's time to go ahead and reveal my full first round mock draft. Check it out, let me know, and go from there. I'll have more analysis over at Going Five Hole in a short bit, with a write-up about why I think these guys are going where they are going. It was a heck of a run for the young team from Western Pennsylvania, but it was not to be, as the Penguins fell two games short of the Holy Grail of hockey. The big question now is how can they build off this with so much change that could happen this summer. The questions about what free agents will get re-signed and for how long will be on the chopping block. Odds are Marian Hossa won't be back with the Penguins, mostly due to the fact that Ray Shero has to re-sign M-A Fleury, Jordan Staal, and Evgeni Malkin to long-term deals, as well as figure out what to do with the likes of Ryan Malone, Gary Roberts, Ty Conklin, Georges Laraque, and Jarkko Ruutu. Granted, everyone after Malone will be affordable and probably easier to get under contract. Yet, that being said-- with only nine players under contract for next season, one being Sidney Crosby, everything should be just fine for the Pens. Building off this season should be the real focal point for the Pens. They say you have to learn how to lose before you learn how to win. Not much losing went on with the Pens this playoffs, which could be counterproductive next season. Sure, it's highly doubtful, but maybe the thought of it being very easy to roll through the Eastern Conference may get into their heads next season and ruin it for them. Let's be honest, being the East Champs really is a albatross for some teams. Last year's champs, the Ottawa Senators, got swept in the first round. The '05 Champion Carolina Hurricanes didn't even make the playoffs, while the '04 Champs, the Tampa Bay Lightning, got ousted in the first round-- albeit after a loss of a season. In fact, you have to go back to the 2001 New Jersey Devils, who made it to the Finals that season, before you have a team who was successful after winning the Eastern Conference title. All the others after them either lost in the first round or didn't make it to the Playoffs at all. The Penguins better hope that curse doesn't linger-longer. There wasn't much about the season the Penguins could look at as a downfall. Without the services of Sidney Crosby and M-A Fleury to injury, others like Evgeni Malkin and Ty Conklin stepped up and showed the depth that the Pens had this season. Plus, the defense was something that improved a lot this season, as it was questionable for the past couple of seasons. All around, the team played very well and the front-office made some crucial moves to make the team what they are today, Eastern Conference Champions. The Penguins will be fairly busy this summer and may be the team to watch in order to see what's going to happen next to them and their core. The fans can bask in their teams success for now, but come October-- it'll be a whole new season. It could keep flourishing for the Penguins, but it could also flounder. Parity is a helluva thing, but for now-- it's all about partying.